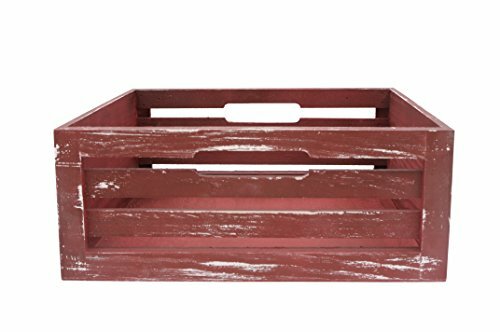 Wald Imports-Antique Red Slat Crate. Fall in love with this functional vintage style crate. Made of distressed red wood with a rustic open slat design. How cute is this to haul your harvest to the house? Take to your garden as you dig up your potatoes, pull your carrots, and pick your lettuce. No Garden? No worries! Keep it in the trunk of your vehicle to hold your stash from the local farmer's market. Bring it inside to add a bit of rustic charm! Cute way to store all of your kids' toys and so much more. Crate measures 12.5-inches square and 5-inches deep. Imported. Size: 12.5" x 12.5" x 5"